Head to the tables in Vegas playing Blackjack Bonanza, which is a classic slots game that you can find at Microgaming casinos. There are 3 reels and 1 payline in the game and while it is simple to play there is nothing simple about the top jackpot of $20,000. The betting range is from 25 cents to $15 for each spin and you can wager up to 3 coins per line. No downloading required here, if you want to try out the game. There is a wild symbol, but that is, pretty much, the only feature with no scatter symbol, no bonus game, no multiplier, and there are no free spins to be won. The symbols you will see in this free slot are stacked bars, 7's, and the Blackjack symbol. The Blackjack symbol is not only the wild symbol, which substitutes for all other symbols, but it is also the one you have to hit 3 of to win the maximum jackpot. Right on the colorful landing page you will see the game's paytable, so you can always check out what the winning combinations are and how much their payout is. 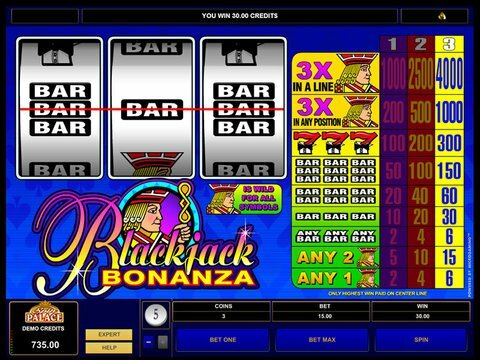 Blackjack Bonanza has solid graphics and sounds and you can be sure of this since the game is powered by the reputable online gaming provider of Microgaming. The 3 betting control buttons of Spin, Bet One, and Bet Max are all located at the bottom of the screen just next to your current game balance. If you think you have a little Lady Luck on your side and you want your chance to win 20 grand then give the solid online casino of All Slots Casino a try, as that is where you can find this free slot game. You will also find a sweet no deposit bonus available to players after they have registered.